Organic vs. Paid Social – Where Should I Put My Money? Every marketer knows the importance of social media in today’s world. 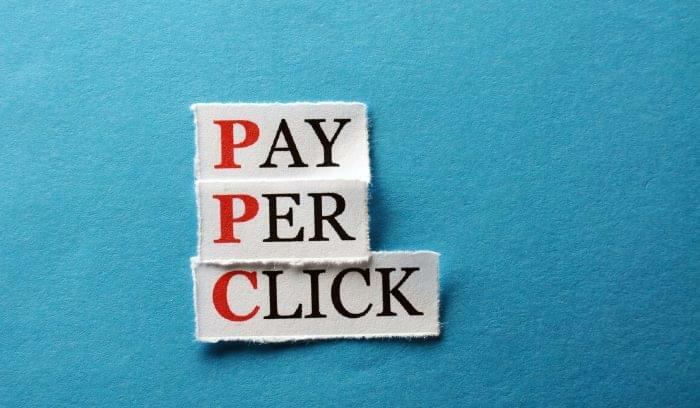 But there seems to be a lot of confusion when it comes to paid versus organic strategies. 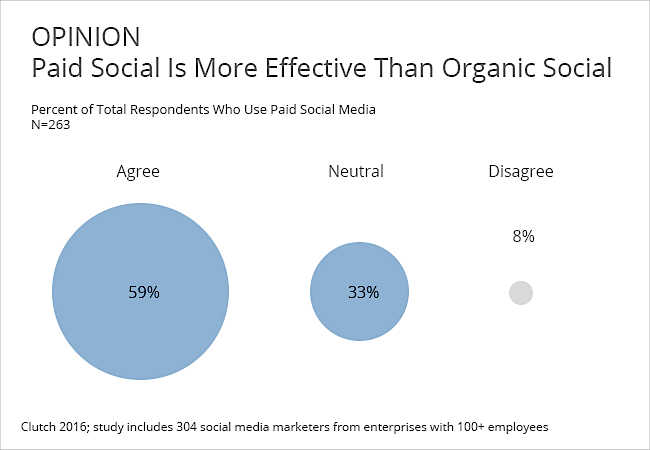 It wasn’t that nearly 60% of marketers thought that paid social was more effective that surprised me. That made sense. What surprised me is what came next. 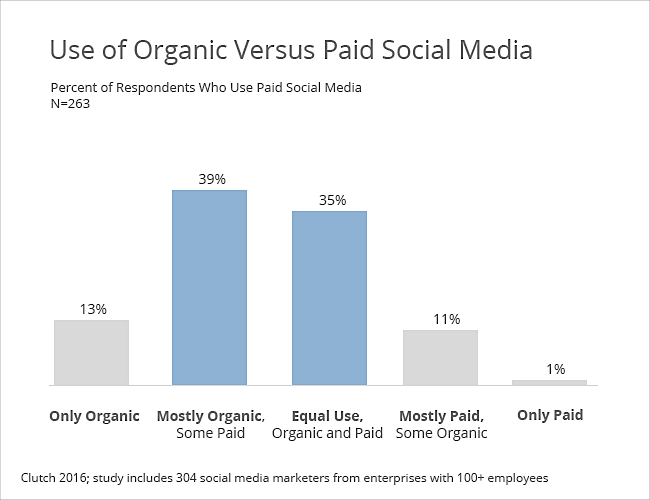 With so many people saying that paid social was more effective, I was baffled that less than 12% of them actually made it the prominent focus in their social media efforts. Less than half even treated it close equal. It’s important to stress that for most businesses, you need both organic and paid social media—but they aren’t interchangeable. Each has their own role to play in your marketing strategy, and it’s important that you use them in their proper place to maximize your ROI. If you want to be perceived as an established business, you need a robust online presence. Today that means having an active social media presence. Think about it: what would you think if you tried to find a company’s Facebook page and it didn’t exist or hadn’t been updated in months and relied on a stock profile photo? Something would smell pretty fishy. On the other hand, if your company comes up in searches on Google and Facebook, and you have thousands of followers and an active feed, potential customers will see that plenty of people have found, used, and loved your product or service before them. Social sites also provide a great place to have conversations with your customer base and encourage them to talk with one another. This tends to increase customer loyalty and improves business through customer feedback. As great as all that sounds, organic social media on its own just doesn’t cut it. Even if you have 100,000 followers, as few as 2% of them might see any given post. In fact, EdgeRank published a study tracking the organic reach of Facebook pages from 2012 to 2014 and found that it was on a rapid decline. It dropped 60% in just two years—from 16% to 6.5%. A report by Social@Oglivy showed an even bleaker picture for bigger brands, reporting that they see as low as 2% reach on their social posts. And that was all before Facebook’s recent announcement that they were going to work hard to reduce the amount of public content from businesses and brands in the Newsfeed. Fortunately, with just a few dollars you can promote your posts and amplify the proportion of your followers who see it. Another great thing about paid social is that you can take it even further than this. 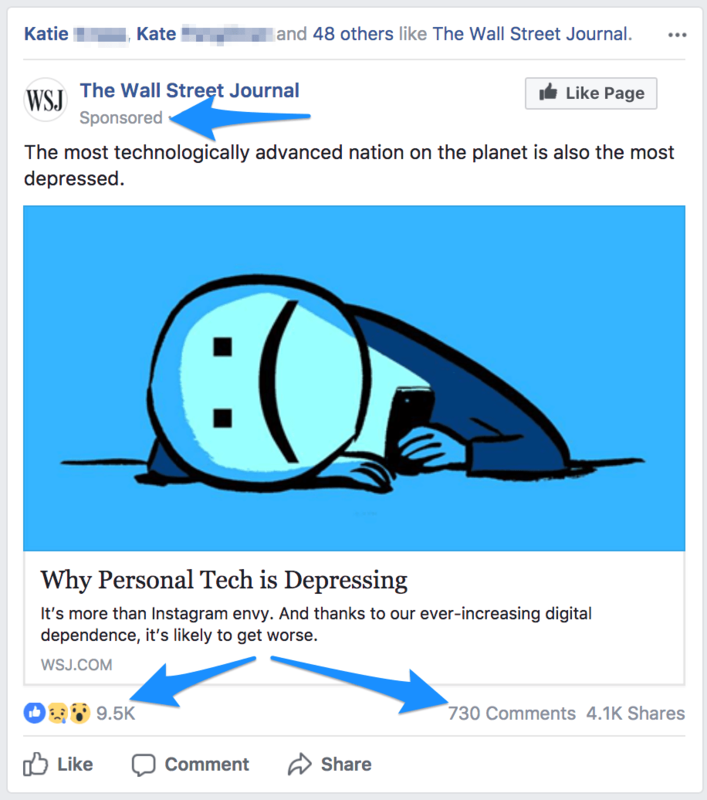 Since sites like Facebook let you target people by other demographic or behavioral traits, you can use these advertisements (a.k.a. 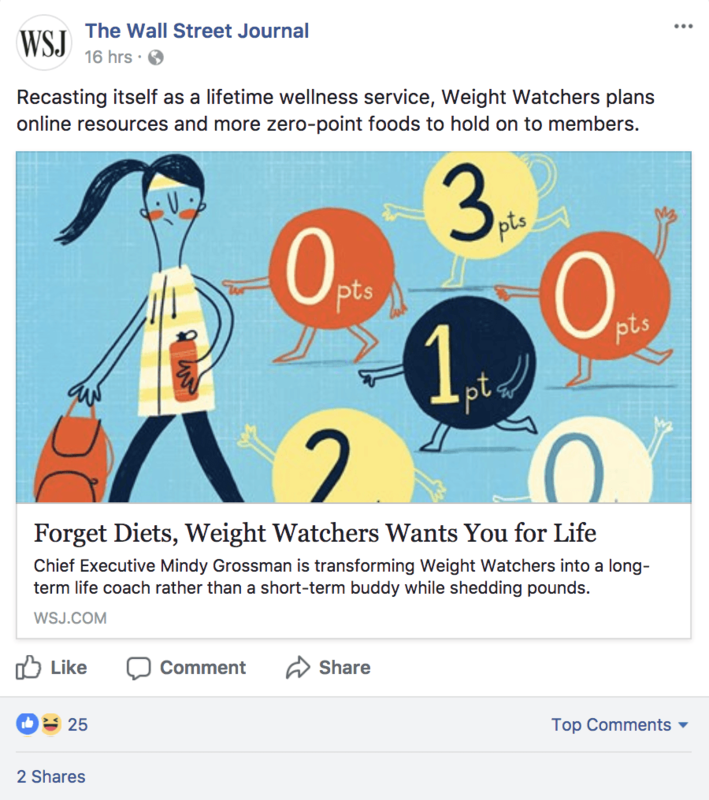 “sponsored” posts) to get in front of new potential customers. If they like what they see, they’ll probably like your page in the process, growing your organic audience as well. 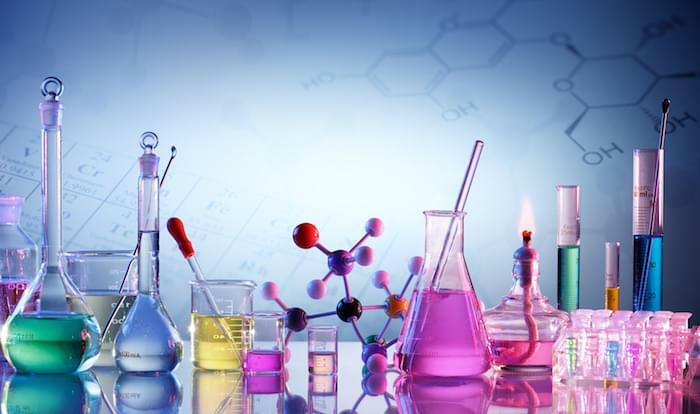 In fact, even the most popular organic posts rarely broke 125 reactions and 10 shares. The last major benefit of paid social is that platforms like Facebook will optimize for conversions and other business goals. If you want more website visitors, Facebook will track that and optimize for it. If you want more lead signups, then it will focus on that. And if you want more e-commerce sales, Facebook will change it up to maximize sales. With paid advertising, you can quickly test multiple versions of an ad to thousands of targeted people. You should see results start rolling in that same day and after a week or two have enough data to make confident, well-informed decisions. This makes your ROI calculations much more clear. So there’s really no reason not to test it out with a low budget and find what results you can bring in. Everyone is obsessed with free. But let’s be honest, you get what you pay for. Don’t want to pay to promote your Facebook post? Then don’t complain when 2% of your audience sees it and you generate a whopping 6 likes and 0 new leads. And let’s examine whether or not it’s really free. A lot of the time, organic social is promoting some type of content you created like a blog post or infographic. Chances are you didn’t find someone so passionate about your business that they wrote it for free, right? Even if you or a teammate created it, that was valuable time you could have spent elsewhere. So, a supposedly free post actually represents a fixed cost. No matter how many people see your post, you pay the same $500. If you could spend just a little bit more money to multiply the reach by 100- or even 1,000-fold, you’ll get a lot more bang for your buck! These numbers are, of course, in British Pounds, but the same logic applies. 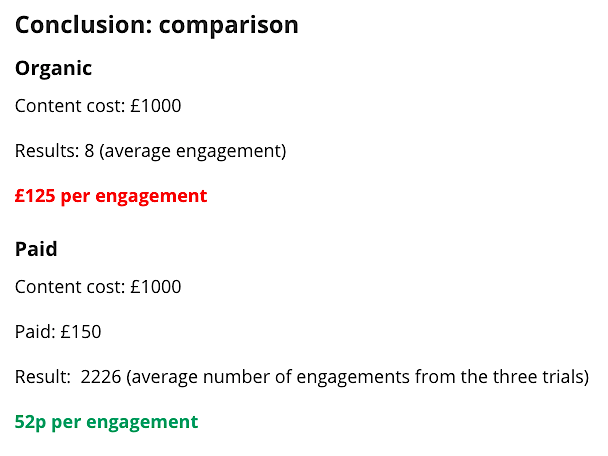 They increased their engagement by bringing their cost per engagement down from £125 to £0.52 by simply spending £150 on social advertising. Even if you don’t spend $1,200 creating your content, even if you only spend about $150 creating a blog post and put $50 down to promote it, you’ll probably still see a similar effect. Creating effective ads might be a new skill set for you, but with potential like this, you shouldn’t let it hold you back. If you want professional results quickly, want to launch large campaigns, or just don’t want to spend the time to learn a whole new skill set, you should invest in a digital marketing agency. But that’s not your only option. Most of these agencies have their own blogs where they share simple strategies for free, too! Just remember, business isn’t about spending as little money as possible; it’s about investing it effectively to maximize your ROI. 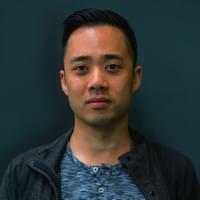 Eric Siu is the CEO of digital marketing agency Single Grain, which has helped venture-backed startups and Fortune 500 companies grow their revenues. He’s also the founder of marketing podcast Growth Everywhere and hosts the Marketing School podcast with Neil Patel.